Football arrived in Malaya with the British. The locals soon picked up the game, and before long it was the country's leading sport. Towards the end of the 19th century, football was one of the central pillars of most sports clubs in Malaya. But it was not structured. Even when the Selangor Amateur Football League took shape in 1905 - which ensured proper administration and organization - the competition was confined only to clubs in the Kuala Lumpur area. In 1921, a national tournament featuring all the states that made up Malaya was started. The competition, known as the Malaya Cup (later renamed the Malaysia Cup in 1963), has been continuously since then, except during the war years. In 1926 the Selangor Amateur Football League was established, and in 1936 the Football Association of Selangor was formed and this association soon started organizing tournaments and this inspired other states in Malaya to follow suit. In 1920, the battleship HMS Malaya visited the country. After engaging local opposition in football and rugby, the officers and men of HMS Malaya decided to commemorate the matches by presenting trophies for annual competitions in both rugby and football in Malaya. In 1926, the Football Associations of Perak, Selangor, Negeri Sembilan, Malacca and the Singapore Amateur Football Association, came together to form the Malayan Football Association (MFA), in order to field a Malayan team against an Australia side that visited Singapore that year. In 1933, the MFA was revived to form the Football Association of Malaya (FAM). Initially, the FAM was based in Singapore. It was chiefly responsible for the running of the Malaya Cup competition. The annual tournament played along inter-state lines was a huge success. The first president of FAM was Sir Andrew Caldecott followed by M.B. Shelley, Dr. J.S. Webster, S.D. Scott, R. Williamson and Adrian Clark, who served up until 1940 before Europe went on a full-scale war with Germany . In 1940, control of the FAM moved from Singapore to Malaya, with A.R. Singham becoming the first Asian secretary in 1941. The FAM's first president after the war was J. E King, to be followed by H.P Byson, and then Dr. C P Rawson, who served for two years before vacating for the first ever non-British personality to take over the helm. 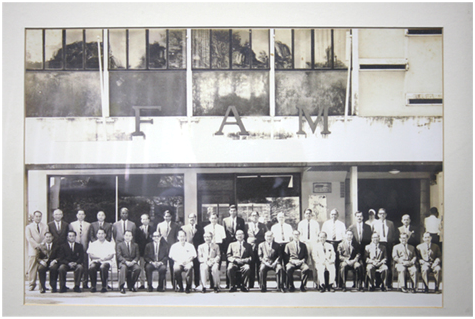 In 1951, Tunku Abdul Rahman (who was to become the first Prime Minister of Malaysia) became the FAM president. It was under Tunku Abdul Rahman that football in Malaysia entered its next phase, with the FAM taking a much bigger role than just being the backbone in the organisation of the Malaysia Cup. The FAM was inducted as one of 14 founding members of the Asian Football Confederation (AFC) in 1956, before becoming a full-fledged member of FIFA two years later. Tunku Abdul Rahman's love for the game was the main catalyst which resulted in the construction of the Merdeka Stadium and in 1957 it became hallowed ground for all Malaysians when it was the venue chosen to announce Malaysia's independence from Britain. It also signaled the birth of the Merdeka Tournament (Pestabola Merdeka), that was to all intents and purposes the centre piece of the independence celebrations. The Merdeka Tournament proved to be a huge success, inspiring similar tournaments like the Jakarta Anniversary tournament, the King's Cup in Thailand and President's Cup in South Korea. The inaugural tournament then the premier football competition in Asia was won by Hong Kong. However, Malaya won the title three years in a row, in 1958 and in 1959, and sharing it with South Korea in 1960. The country qualified for the 1972 Summer Olympics in Munich and the 1980 Moscow Olympics. Following the change in name to the Football Association of Malaysia in the early 1960s, Tunku Abdul Rahman continued to play a big role in the development of the game through various youth competitions. Following his departure in 1975, the reins of the FAM was taken over by Malaysia's second Prime Minister, Tun Abdul Razak, who served for just one year. The post was then filled by Tan Sri Datuk Seri Setia Raja Hamzah Haji Abu Samah in 1976, who was the Minister for Trade and Industry at the time. Between 1976 and 1984, various football activities were introduced under Tan Sri Datuk Seri Raja Hamzah, and Malaysian football reached a new height in the international arena following his appointment as the AFC president. The FAM entered a new era of modernization and professionalism when His Royal Highness the Sultan of Pahang, Sultan Haji Ahmad Shah took over. His Royal Highness was integral in the growth of football in the new era with the introduction of the semi-pro league in 1989 before the game went fully professional several years later. Among the high points in Malaysian football under His Royal Highness was the successful hosting of the 1997 FIFA World Youth Championship, as well as the organization of the Premier League, which has been called the Malaysia League (M-League) since 2004. During the glory days of Malaysian football in the 1970s and 80s, names like Mokhtar Dahari, Santokh Singh and Soh Chin Aun would strike fear in teams all over Asia.